Looking for a bit of extra money for Christmas presents? If you get involved with PokerVIP's record-breaking Winter Miracle promotion then you could soon be spending your share of the huge $210,000 on offer. Winter Miracle is the largest ever rake race promotion held by an affiliate in the winter months, but it's not just one rake race. As well as the $50,000 mega race you can take part in a series of $15,000 sprint races. Win them all and $22,000 is all yours. There's something for everyone, with the mega race paying out the top 250 players on the leaderboard and the sprint races awarding prizes to the top 200. and all the usual poker bonuses and deals will remain available to PokerVIP players throughout. 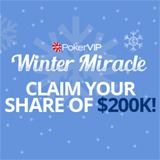 To find out more about the Winter Miracle promotion, visit https://www.pokervip.com/en/promotions/winter-miracle.